VideoProc can also batch download contents from YouTube and over 1,000 other sites, record your desktop/iOS screen, convert and backup DVDs and more. When you’re editing video and audio files, you need software that will make it as quick and effortless as possible. VideoProc, a brand-new video processing suite from Digiarty Software, lets you convert, edit, resize, adjust, download and record all kinds of video files in the blink of an eye. Generally speaking, VideoProc accepts almost all media files, including 4K, 8K and 3D videos, high-speed and slow-motion recordings by GoPro, DJI Drone, iPhone and other devices, audios and clips downloaded from YouTube, content from DVDs, and even folders and ISO images. And the full GPU Hardware Acceleration makes the most of your computer’s resources, using Intel QSV, Nvidia CUDA/NVENC and AMD hardware to encode and decode videos incredibly quickly. In addition, you can use VideoProc to convert multimedia to desired formats, resize GoPro video, convert and backup DVDs, and even record your screen! VideoProc host competitions all year round. Stay tuned on VideoProc's YouTube channel, for chances to win an iPhone XS, DJI Spark, and more! GoPro action cams, DJI drones and smartphones are all capable of recording amazing 4K footage, but the size of the generated video files are huge! Typically, one minute of 4K video in H.264 format at 30fpsis approximately 350MB. Not only do they occupy too much space, large files also have slow playback, editing and loading speeds in media players and common video processing programs, and are difficult to share with others due the limitations of the video length and file size of YouTube, Facebook, Instagram, WhatsApp, emails, etc. Hence, to solve the problems caused by large 4K videos, an easy-to-use yet powerful video processing software like VideoProc comes in need. Let's see what you can do with VideoProc. 1. Convert video codec to highly compressed MP4, HEVC format, reduce video file size without quality loss. 2. Cut video length or split into several clips. 3. Crop to remove unwanted parts to a different size. For example, you can crop to the most common aspect ratio for videos – 16:9 for widescreen. 4. Adjust video parameters like bit rate, frame rate, resolution, etc. 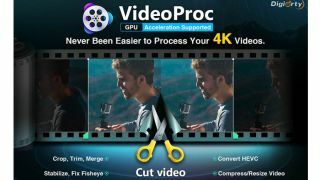 VideoProc has a complete toolbox for you to process any GoPro, DJI, iPhone videos at ease. You can do basic editing like merge different clips into one; rotate, mirror and flip a video; adjust audio volume/delay; change video playback speed; convert video to GIFs, add subtitles and watermark in image or text; take screenshots and apply effects to videos, etc. Advanced users can process and stabilize shaky videos shot using GoPro action cams, DJI drones, phones and other devices by removing or lessening shakiness and noise. You can also enhance GoPro video quality, correct fisheye lens distortion and turn your video into M3U8 profile for live streaming in simple clicks. Moreover, the video processing is boosted by hardware acceleration, which allows you to process, convert and edit videos at 47x real-time faster with low CPU usage, and no crashes or lags at all! A step-by-step guide to process videos is also available for your reference. If that’s not enough, VideoProc includes a full suite of DVD video processing tools that make it a one-stop multimedia processing suite. With a few simple clicks, you can process and convert videos, audios and DVDs to digital formats, download and record videos without limits. With 370+ built-in video audio codecs, VideoProc lets you process and convert nearly any video to any format, such as multi-track MKV to MP4, M4A to MP3, YouTube to MP3, etc. And the 420+ ready-made profiles give you customized playback experience on iPhone, Android, Samsung, tablets, game consoles, HDTV and portable players and more. Plus, VideoProc allows you to convert DVD discs, ISO images and DVD folders to digital formats for further processing and editing, like converting DVD to MP4, AVI, WMV, FLV, MOV, MKV, MPEG, H.264, etc. And its six DVD backup modes help you save your data before it’s gone forever. Equipped with a powerful video downloader engine, VideoProc lets you batch download movies, music, live videos, playlists from YouTube, Facebook, Dailymotion, Instagram, SoundCloud and 1,000+ other sites, saving videosoffline with up to 4K/8K resolution. Uniquely, you can also log into your social media account and download private videos and even your personal watch later list. If you love to record your games, tutorials for sharing with others or save some undownloadable videos offline, VideoProc offers you three types of recording modes: record full or part of the screen; record video with your webcam; record with both screen and webcam (picture-in-picture mode). VideoProc is an easy-to-use yet powerful video processing application for all types of users. Why not get this all-in-one multimedia suite to make your videos stunning now?